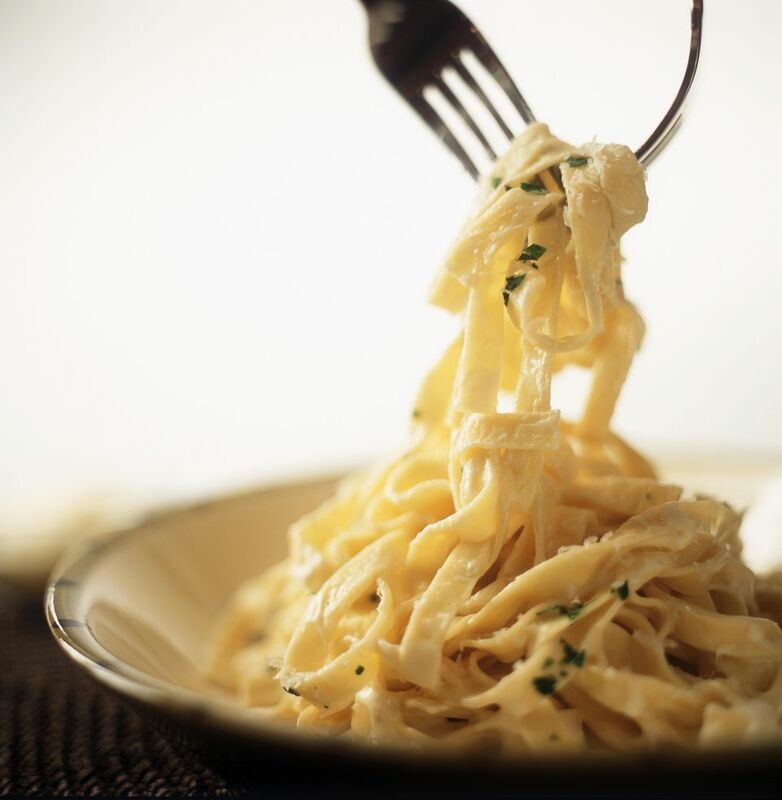 Classic Fettuccine Alfredo is a simple recipe, made with the best ingredients. It's a splurge, not for everyday meals, so enjoy it! Don't try to substitute margarine for the butter, cheese from the green can for the real thing, or light cream or milk for the heavy cream. This recipe should be made just as written, or you will be disappointed with the results. Because the recipe is so simple, you need the best ingredients. The garlic must be fresh, the cream thick and rich, and the Parmesan cheese freshly grated from the real thing - a wheel of cheese. If you can find fresh fettuccine, all the better! Just remember that fresh pasta only takes two or three minutes to cook, so time the recipe accordingly - have the sauce waiting for the pasta. Another trick to making the recipe as excellent as possible is to serve it the second it's done. This recipe cannot wait around for your guests. Have your guests sitting at the table waiting for the pasta! The combination of tender pasta, rich sauce, melted cheese, and the cool chopped parsley and basil is beyond delicious when eaten immediately. Serve this classic Italian dish with lots of garlic bread, a simple green salad, and some white wine. That's all you really need for a superb dinner. Bring a large pot of salted water to a boil. Cook pasta until al dente according to the package directions. Meanwhile, melt the butter in a large saucepan over medium low heat; add the garlic; cook and stir 2 and 3 minutes until the garlic is fragrant. Don't let it burn or turn brown. Add the cream, salt, and pepper to the garlic in the pan; heat over medium heat until steam rises from the pan. Toss the Parmesan cheese with the cornstarch and add to the sauce along with the lemon juice. Stir this mixture constantly over medium low heat until the sauce blends and is creamy. When the pasta is done, drain, reserving 1/3 cup of the cooking water, and add to the sauce. Toss, using large tongs, until the pasta is coated, adding reserved cooking water as needed to make the sauce very creamy. Sprinkle with parsley and basil and serve immediately with lots of toasted garlic bread and white wine.